Onychomycosis is a fungal infection of the toenails. 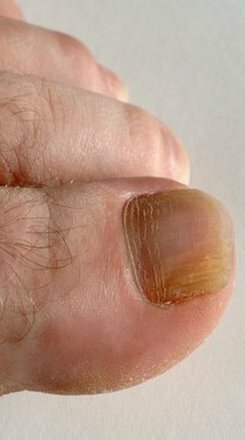 This ailment causes toenails to thicken, discolor, disfigure, and split. At first glance, onychomycosis appears to be only a cosmetic concern. However, without treatment, the toenails can become abnormally thick forcing the toe to press against the inside of the shoes, causing pressure, irritation, and pain. Generally, onychomycosis does not have any symptoms. Individuals seek treatment for cosmetic reason, not because they are experiencing pain. However, if the disease continues to progress without treatment, onychomycosis may interfere with standing, walking, and exercising. Onychomycosis is easily identified by its appearance. However, there are similar conditions and infections that can cause the nails to host a similar appearance to onychomycosis. Onychomycosis is generally established by laboratory tests before beginning treatment. Treatment options vary by individual and severity of the ailment. Talk with your doctor about what treatments will work best for you. These may include oral anti-fungal medications, topical creams and solutions. Lasers are the safest method of treatement developed so far. It carries no risk of side effects as are usually experienced with traditional oral anti-fungal medications. Call us today to discuss your treatment options for Onychomycosis and be on your way to beautiful clear nails!